Home > Mark Your Calendar!!! • People You Should Know in Racing > A Happy Convergence: Brian Fox, American Pharoah, Saratoga–and YOU. If you’re a fan of Boston-based artist, Brian Fox–obviously, you are an insightful soul, one who appreciates beauty, power and spirit. If you’re not-yet a fan of the world-renowned artist–well, first I wonder where the heck you’ve been for the last 10 years. But that’s OK, I’ll cut you some slack this time. If you’re one of the lucky 1,000 or so who attend the Siro’s Cup at Siro’s–the unofficial clubhouse of Thoroughbred racing–on Thursday evening, July 23–you should wander into the Green Room. (The more-private room, off the main dining room.) Gaze upon the wall and see…American Pharoah in all his strength, speed and soul. 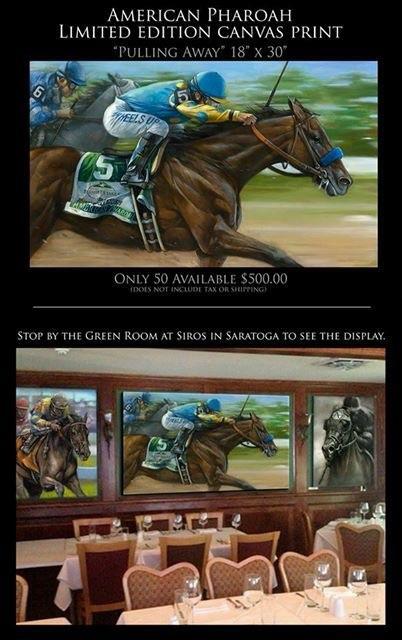 Yes, that painting of the Triple Crown winner–one of the honorees at the Siro’s Cup party–found his way out of the imagination, heart and hand of Brian T. Fox. Yes, you may stand in awe. Yes, you can acquire one of the (very) limited-edition prints of Brian’s phenomenal work of great love. If you can’t make it to Siro’s on Thursday–let that fear dissipate. Brian’s American Pharoah will be there all during the Saratoga meet–that is, unless–I’m thinking–someone buys it right off the wall! Now…should you not dine at Siro’s, or otherwise find your way into the Green Room this summer…you can grab a copy of Equicurean magazine. You’ll be able to pick up copies of Equicurean at Saratoga’s finer establishments, including the Fasig-Tipton grounds; Saratoga National Golf Course and the Gideon Putnam Resort. 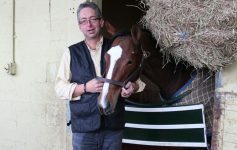 If you’re a fan of Brian–you may be a collector, even–you’ll be thrilled to know that he’ll be in town for the first night of the Fasig-Tipton Saratoga Sale. He’ll arrive on Sunday, August 9th and split for home on Tuesday, the 11th. But in the meantime–he’ll be at the track, on the Fasig-Tipton grounds and everywhere in-between. He’s not hard to identify: he’s unfairly-handsome. About 6’5.” And I’ve never seen him without a big, joyous smile on his face. Whether at the races or in the crowd at Fasig-Tipton, he’ll probably tower over nearly everyone, so finding him is easy. So, yes–get to Siro’s. See American Pharoah in all his glory. Pick up a copy of Equicurean, and read what I wrote about Brian Fox. And if you see Brian in a crowd, or walking down a street in Saratoga–don’t hesitate to go up and introduce yourself. He loves meeting fans–he’s always happy to talk about art, and horse racing–and yes, indeed, if you want to commission a painting, you can discuss that, too. For more information about the full range of Brian’s art–his story–and how you can acquire prints, giclees and originals–check out his website. Have a wonderful Saratoga meet, friends. And take time to fill your space and your heart with Beauty and Truth. And of course–one of the best ways to do that is to gaze upon the art of Brian Fox. Just stand there. Take it in. Breathe. Thank God for that moment of quiet in our otherwise-noisy and oft-invasive world.